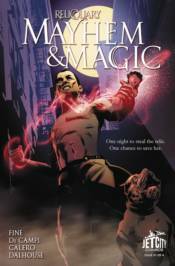 Bestselling author Sarah Fine gives hard-boiled noir a magical edge in this stand-alone four-issue comic book adventure-where crime collides with conjuring in the spellbinding world of her Reliquary series. Freelance thief-for-hire Asa Ward's latest job is heisting a powerful magic relic from a gangster's lair. But what should be an easy payday quickly becomes larceny the hard way-when he's dragged into a three-way crime war where mind-bending, body-racking magic is the most lethal weapon of all. And just when Asa thinks he's scored, the ruthless kingpin he's ripping off strikes back, threatening the only life Asa values more than his own.